Images are very powerful tools of representation. They serve as evidences and records of events past, and may reflect visions and the uncertainties of the future. Visual media has been the subject of interest among geographers since the 1980s, particularly the landscape paintings of the 18th and 19th centuries through which the social and political contexts of the time could be gleaned, further enriching our understanding of the relationship between place and power through analyzing the materiality of the art work and how its subject is portrayed and gazed at. Recent developments in landscape and place studies extend such geographic explorations from treating art works as a subject of analysis to looking at art as a process and by incorporating art as a method, resulting in the collaborative engagements between artists and geographers (Hawkins, 2011). The integration of art and geography opens new opportunities for participatory research as it offers novel means of articulating our understanding of space and place. The affective qualities of images can be utilized to reconstruct the past, communicate the salient characteristics of our environment, and to visualize our imagination of the future. 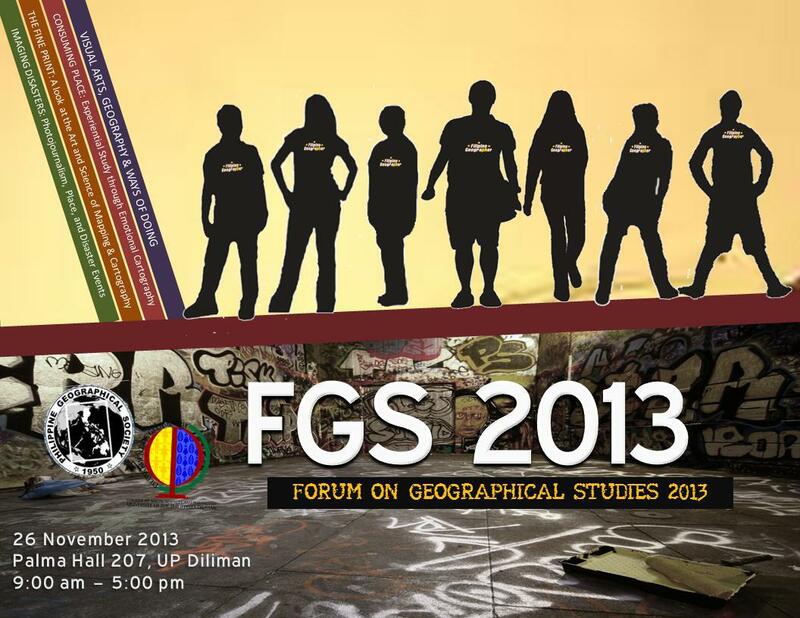 The 2nd Forum on Geographical Studies (FGS 2013) combines paper presentations with lectures by Filipino visual artists on the agency of images to influence our knowledge of places and the events that impact our communities. The first panel, “Research Engagements of Young Filipino Geographers” showcases undergraduate and graduate theses of young scholars on various themes of human geography in relation to exploring the diverse aspects of Philippine society. The second panel entitled “Visual Arts, Geography, and Ways of Doing” underscores the potentials of merging art theories and geographic themes in advancing research methodologies through more creative avenues that could encourage broader community participation and interdisciplinary collaboration, in the hope that such ways of doing would allow us to know more and to know better. To get a pdf copy of the program, please click here.